join us Friday night as we head over to our other favorite venue, the wonderful Underground Arts Exchange for a night of celebrating with friends and family and more friends! The Chillz make rock, folk, ‘n roll of the coastal mountain canyon valley variety based on the songs of cousins Jeff Lennon & Vaughn Montgomery, who grew up in Foster Park bending their ears to hear their musical hero, Jeff’s dad, Tom Lennon. Last year, by way of the hands & hearts of Soren Mitchelll, Eric Sullivan, Joshua Moreau, Ted Lennon, & Oliver Oliwa Newelll, they became The Chillz. 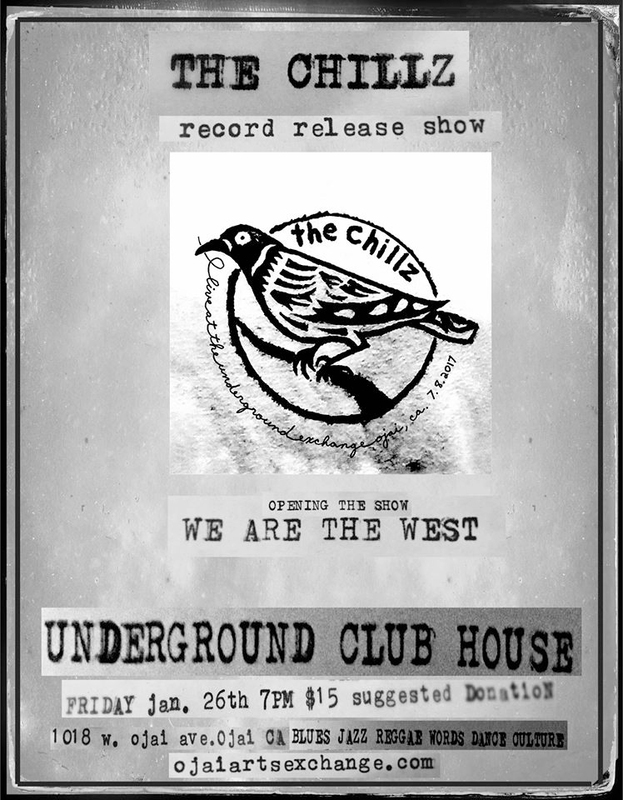 They recently released their first record, “Live at the Underground Exchange,” which is available on the down low at thechillz.bandcomp.com. This show is their record release party, so lets support them and have some fun! Opening the show is WE ARE THE WEST, noted as a convergence of sound and space. Dedicated song-stylists, the Los Angeles-based group has developed a uniquely immersive approach to performance, playing both concert halls and improvised venues, including their acclaimed underground parking garage concert series. This spring they release their first full-length album, The Golden Shore. Join us for this wonderful night of music Friday, January 26th at 7:00pm. $15 suggested donation at the door, all ages welcome!